One of the nicest things you can get the RYO smoker on your gift list is a pipe. 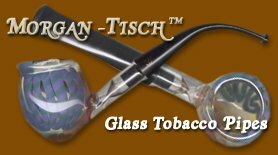 Not just any pipe mind you, but one that is conducive to smoking cigarette tobacco and of course, pipe tobacco as well. The characteristics of such cigarette tobacco pipes are pretty uniform. They need to be small with a shallow, wide bowl and a wide stem. The wide, shallow bowl makes the pipe easy to light with a cigarette lighter and easy to burn small amounts of tobacco. The wide stem is more comfortable for the occasional smoker as a narrower stem puts added pressure on the teeth and can actually make your mouth sore. There are a number of pipes that fit this description and we will show you some of them here. The ones at left are available in many tobacco shops including Cascade Cigar (www.cascadecigar.com). They range from $5-$20 there, come in mix and match display boxes and are of surprisingly good quality. Now Cascade is a professional pipe shop and has a huge inventory of very expensive, top quality pipes with professional sales staff to match. Nonetheless, they are aware of the trend for cigarette smokers and offer some real deals for the occasional puffer. 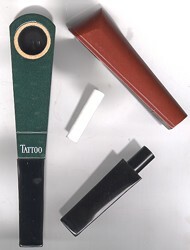 The Tattoo pipe from Music City Marketing is an innovative Dutch design that is beginning to attract attention. Contact Music City by clicking on their link above to find out who the retailers of this item are. Calabresi makes several small pipes that fit the bill and are available at Carey's Smoke Shop (www.smokecheap.com) and they cost even less and are of equal or better quality. Our favorites (price and quality considered) come from HJ Bailey ( http://www.hjbailey.com )but you will have to visit their site and email them for dealers that carry them as Bailey is a wholesale only outfit. The ideal Bailey pipe shown at left should cost in the range of $30 or less and is a top grade smoking tool for both the cigarette tobacco or pipe tobacco smoker. These are truly outstanding bargains and compare in quality with pipes costing 3 or 4 times as much. For a short smoke, nothing beats a small pipe, and good tobacco even when inhaled, tastes surprisingly mild in them. Many folks are finding the method preferrable to injecting or rolling cigarettes and one usually finds that the amount of tobacco one goes through to be reduced and the frequency of lighting up likewise less. Also you can smoke more heady tobaccos like Gauloises, Drum, Jester, or Bull Snit and inhale with less dizziness (as long as you don't take too big of a hit, of course) and the aroma is truly outstanding without being as sickly sweet as many pipe tobaccos. Got a five minute break and want a quick smoke, well here is your answer. There are also some ornamental pipes at Music City Marketing that we have found to be quite entertaining, beautiful and functional. The URL is: (www.musiccitymarketing.com) and you should contact them to find retailers in your area or online who have these. While not cheap, these are definitely impressive gifts for their $40 price. The meerschaum pipe at right is a bit more than the standard carved briar but is gorgeous. 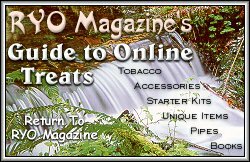 There are many hundreds of tobacco/cigar/pipe shops in the US and while many have some very expensive offerings for the connoisuer, most have reasonably priced ones as well. Remember shallow, wide bowl and wide stem for the occasional smoker. And one last hint though, there may not be enough time for receiving product before the holidays. 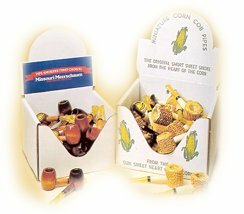 There is a great meerschaum pipe maker at www.whitepipe.com that bears taking a look at as well as a large selection of pipes at Lighters Galore (www.pipeshop.com). Retailers should also take note that Music City Marketing (www.musiccitymarketing.com ) has an outstanding selection of really superb briar pipes that cover the spectrum of price and design. Of special note is their Butz-Choquin Private Label Collection.